Several of our newsletters have both a daily version as well as a longer weekly "digest" version that includes all the content of the daily newsletters. 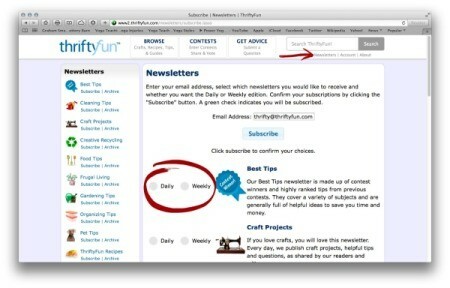 Consider changing any "Daily" newsletters to the "Weekly" version, to receive one larger email each week. You may also want to remove the Tip Of the Day Newsletter from your subscription. These are our "best of" tips and are often similar to what you will find in the longer Daily Thrifty Tips Newsletter. Every post that appears in our newsletters shows up on our site. There are some people who browse the site every day to see what titles are of interest to them, as time permits, rather than subscribe to the newsletters. Additionally, we have archived copies of the newsletter available on our site, simply click on the Newsletters link and select the newsletter's "Archive" link. If you wish to continue receiving all your newsletters, you can set your email program to filter them into special folder instead of your inbox. This way, they are not in your inbox to be dealt with, but you can always access them when you have time. Contact your email provider or the Help menus of your email program for specific instructions for setting up folders and filtering emails. You can also unsubscribe entirely by clicking on the "Safe Unsubscribe" link at the bottom of each newsletter. Generated 2019/04/18 10:23:43 in 72 msecs.